As most of you know, my son Devin got married on November 15th. The wedding was wonderful and everyone had a great time. In fact, the wait staff mentioned that with all the drinking that was being done, they were surprised there were no brawls. Just everyone enjoying themselves and getting along with each other. I did a lot of sewing for the wedding. I made eleven wedding bags; one for the Bride, three for the bridesmaids, two for the mothers, two for the grandmothers and three for the aunties. 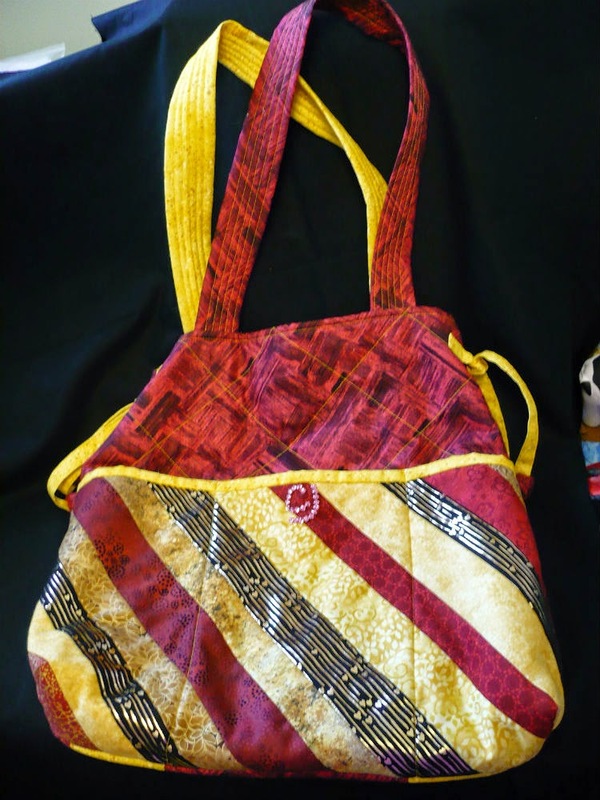 I used the same bag pattern, with each bag having it's own focus fabric and the pocket stripes used fabrics from the other bags. The Bride picked which bag each person was to receive and jewels were sewn in their initials on the bags. For those who are Harry Potter fans, the Gryffindor colours of Red and Gold were chosen by the Bride. 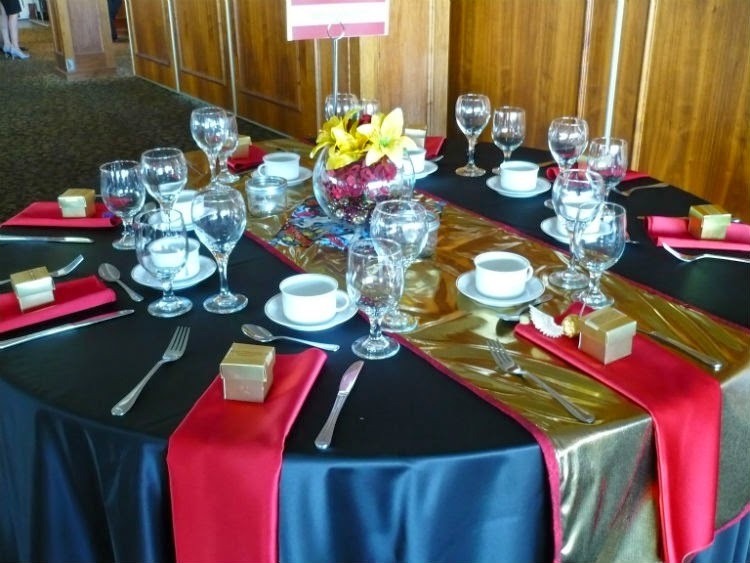 As my son and new daughter-in-law are also comic book aficionados, I also sewed 16 table runners in gold lamé with red binding. Again, the Gryffindor colours were chosen. The table runners were lined and on the top a square of superhero fabric was sewn. Fabrics for Batman, Wonder Woman, Superman, Spiderman, Thor, Wolverine, Captain America, Green Lantern and The Hulk were found and used. My son and daughter-in-law wanted a "nerdy" wedding, they provided gold boxes with special wedding M&Ms and a saying from The Simpsons show on the box. A card box was made like Dr. Who's TARDIS (time machine). 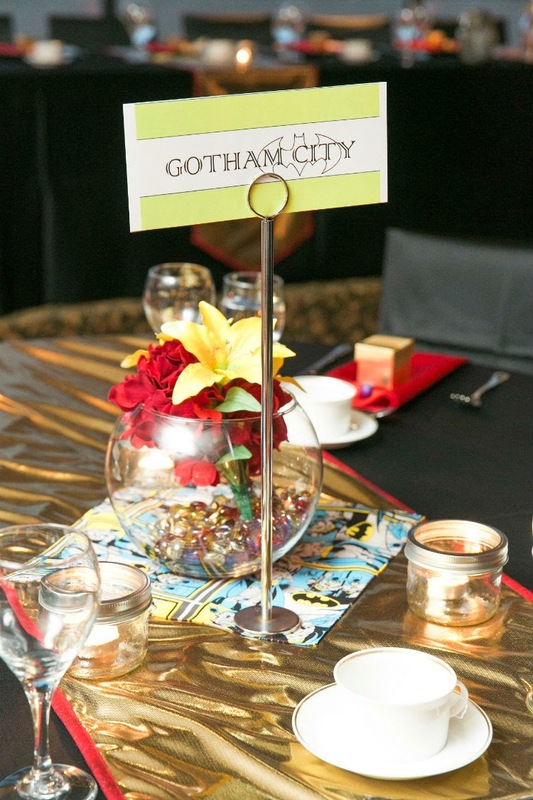 Each table was labelled with a city where a superhero resides. The bridal party made their entrances to wrestling music. 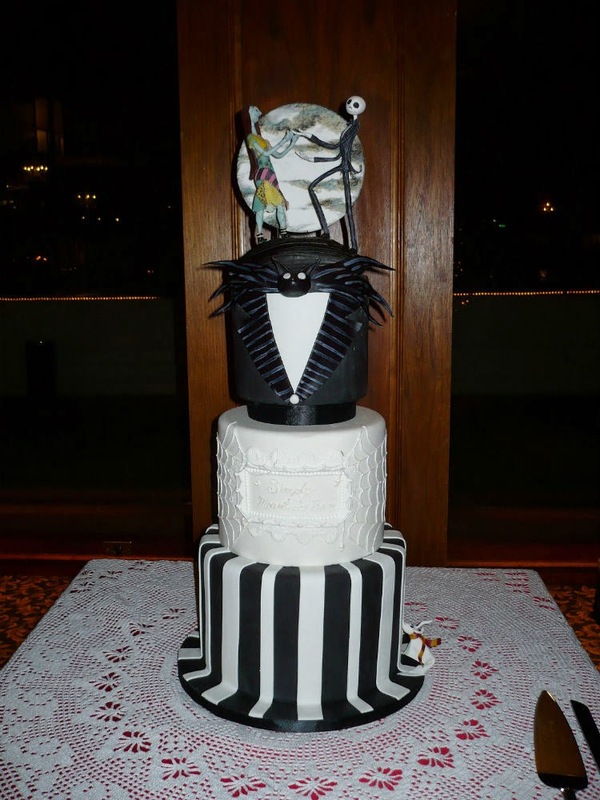 The wedding cake was from The Nightmare Before Christmas with Jack Skellington and Sally as the bride and groom and Zero at the bottom of the cake. The crocheted tablecloth under the cake was handmade by the Bride's grandmother before she died and was designated specifically for her wedding day. 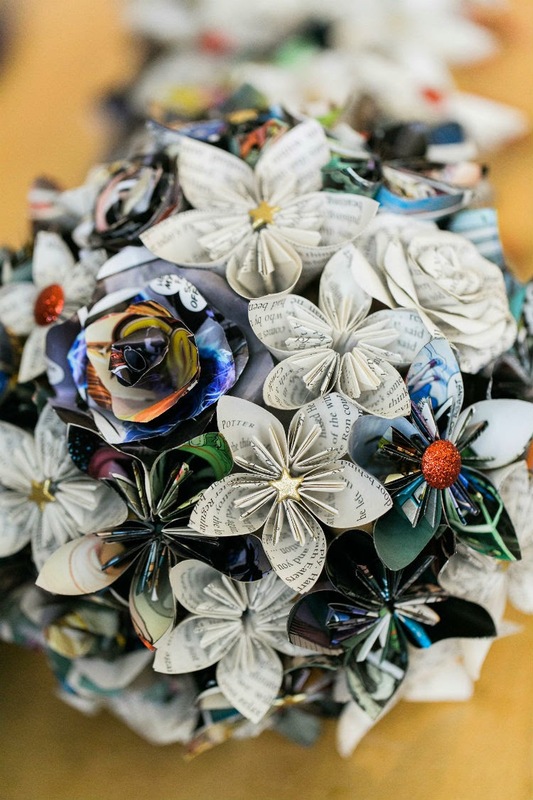 The bride's and bridesmaid's bouquets were origami flowers made from old comic books. Because my son is a Maple Leafs fan, Deja was able to find a garter from the team to surprise Devin when he took it off to throw to the single men. He wasn't going to throw it until she let him know that she bought two as she knew he'd want to keep one. 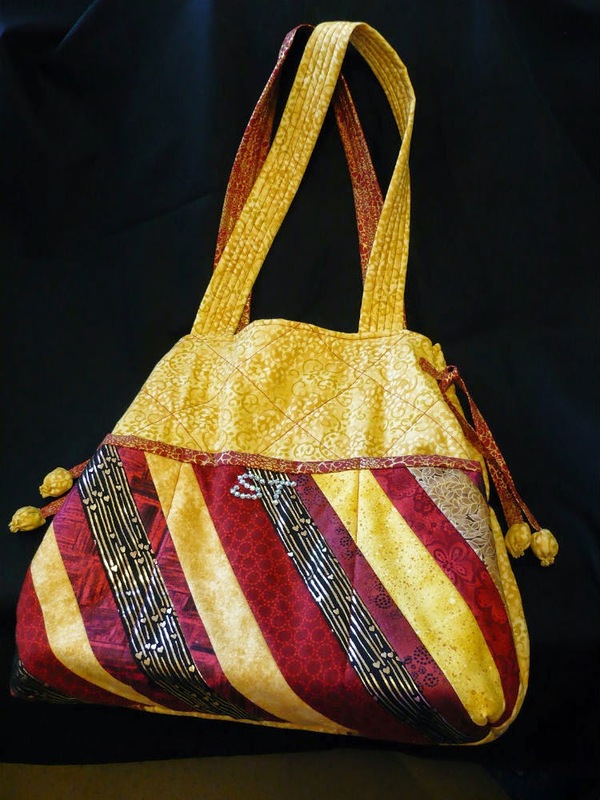 The final item I sewed was a bag to hold a wine glass that is broken at the wedding. This is a Jewish rite to symbolize the destruction of the temple in Jerusalem 2,000 years ago and a reminder that sorrow is as much a part of our life as joy. 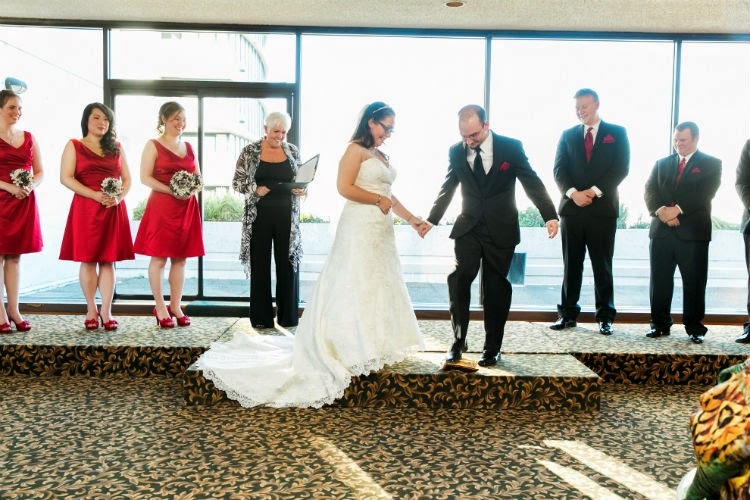 The bride and groom keep the broken glass as a memento of their special day. This was a very eventful day in my family's life and will be long remembered and cherished. Lovely day Linda,you did super work. I especially love the wedding bouquet. I love all the geeky bits, especially the origami bouquets. A lot of thought must have gone into this. What an amazing day this must have been for both families... the table cloth under the cake is not only beautiful but also so very special. Linda - what a lot of work went into making this a day of wonderful memories! I have never seen a more thoughtful and carefully crafted event with so many wonderful details. May the rest of their lives be as blessed as this special day!